Maricel Soriano is at the center of controversy following the results of the recently concluded 'Magpasikat 2017' of It's Showtime. The Diamond Star,who was one of the judges, gave Team Anne, Ryan and Nadine a poor score for their music video-like performance. She only scored 6, resulting in their team's loss. Other four judges - Direk Rory Quintos , Janno Gibbs, Ina Raymundo and Marc Logan - gave their team 3 10's and a 9. Thus, some netizens lambasted her for giving them such score. 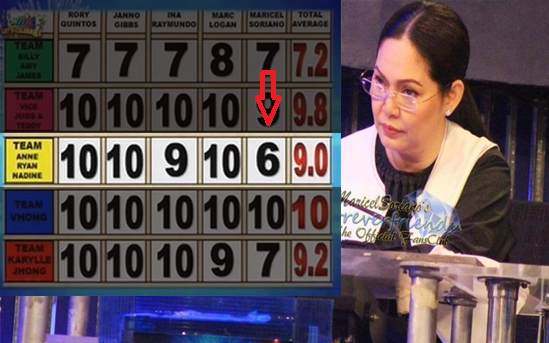 "Pero epic talaga yung 6 na score ni Maricel Soriano sa Team Anne like, what? Huh? Paano? I don't expect them to win but hey, they don't deserve a "6". Parang di ka fit mag judge!" other one said. Meanwhile, others were quick to defend her, telling everyone to respect her way of judging. Team Vhong was hailed as this year's Magpasikat grand champion. Team Vice Ganda, Jugs and Teddy placed 2nd while Team Karylle and Jhong landed in third place.